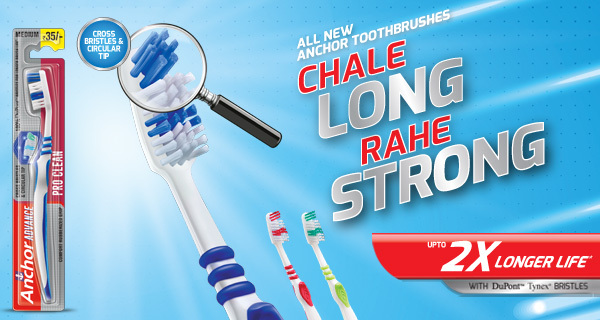 Anchor Toothbrushes are crafted with industry leading, DuPont bristles, the Anchor range of toothbrushes offer a complete and comfortable brushing experience along with a superiorly long brush life. Our toothbrushes come in 2 range of brushes, Anchor and Anchor Advance. These brushes range come together to give you the best combination of both DuPont Tynex and DuPont Herox bristles. Wave toothbrushes come with a comfortable grip and provide a great all round cleaning. End rounded bristles effectively protects your gums and your teeth enamel. Comfort Clean toothbrushes come with slip proof grip. It is gentle on teeth and gums giving a comfortable cleaning experience. Specially rounded bristles protects gums & tooth enamel. With a sleek head that helps deeper reach during brushing. Excel brushes come with high density bristles ensuring great mouth feel while brushing. Mega comes with an angular handle coupled with high density bristles which helps in deep cleaning. Unique hi-tip bristle design with curved bristles cleans between the teeth. Hi-Tip design with softer & longer bristles helps remove plaque & bacteria. Twin bristle length with angular bristle head helps clean between teeth. Specially designed Twin level of bristles to help clean between teeth. A spring action neck gives a better maneuverability while cleaning. Its zig zag bristle design helps clean between the teeht and along the gum lines. Zig zag bristles on the brush head for in between cleaning of teeth and preventing bacteria formation. Multi angled bristles for proper cleaning for teeths and gum. Multi direction cleaning ensure effective cleaning in fewer brush strokes. Special Z shaped bristles give you deep cleaning of teeth and flexi spring neck keepts it gentle on the gums. Its circular tip head gives multi direction cleaning and the soft rubberised grip makes comfortable brushing experience. Criss cross pattern bristles provide multi direction cleaning. Soft bristles and little head for milk teeth cleaning. Little head for cleaning all around and milk teeth. Soft bristles and small brush head for kids. Comes in exciting rubberised animal design handles. Handle with special Jungle themed designs for kids. Thicker handle at the end to enable better toothbrush balance while brushing.